Assigned to the 24th Special Tactics Squadron, Pope Air Force Base, N.C.
Air Force Tech. Sgt. John Chapman was killed while on a rescue mission during Operation Anaconda. The Combat Controller had been trapped for over an hour, fighting off, and killing, several enemies before they overran his position and took his life in hand-to-hand combat. John was born in Springfield, Massachusetts in 1965, but grew up in Windsor Locks, Connecticut. He graduated high school in 1983, before enlisting in the Air Force in September of 1985. Originally he served in the 1987th Information Systems Squadron at Lowry AFB, Colorado from 1986 until 1989, before cross-training to become a Combat Controller in 1990. He served in several assignments before his final assignment with the 24th Special Tactics Squadron at Pope AFB from October 1995 until he was killed in action 2002. Growing up, John never shied from a challenge; he constantly worked so he could consistently do his best. He spent time playing the accordion, and was on the swimming and diving varsity team in high school. Working in the Air Force was John’s passion, but his greatest happiness came from spending time with his family, enjoying married life and being a dad to his two little girls. Those lucky enough to have known John, knew that he would do anything in his power to help someone in need, given the chance. “Johnny was a kind and loving person who truly went out of his way to help others from the time he was a little boy. He was also a rascal who loved life and wanted to live it to the fullest,” his mother, Terry Chapman said. In John’s final moments, he lived out his promise to do everything possible to protect his men, taking out several enemy forces and providing cover for a helicopter that had been shot down. His actions during that interaction led to a posthumously awarded Air Force Cross, becoming only the 5th Airman to receive the medal during the War on Terror. “Through his extraordinary heroism, superb airmanship, aggressiveness in the face of the enemy, and the dedication to the service of his country, Sergeant Chapman reflects the highest credit upon himself and the United States Air Force,” his citation read. TSgt John Chapman was 36 years old from Waco, Texas. 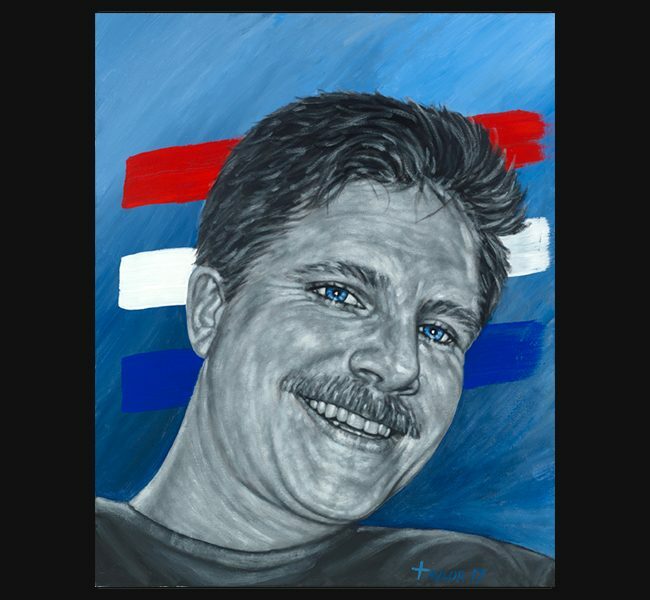 The original portrait was delivered to his mother and family at a special memorial event held by the Combat Control Association in Destin, Florida on October 19, 2017.